Bridge is the most popular card game in the world. It can be played by anyone from age 5 to 100+! The benefits for children include improving skills in numeracy, problem solving, memory and concentration. For older players research has shown that bridge can even have health benefits as the mental stimulation helps keep the brain active. 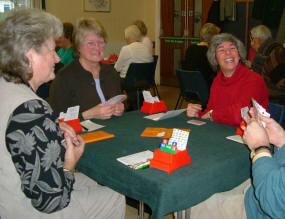 Bridge can be played at many levels... ranging from a social foursome (an excuse for a cup of tea and a gossip! ), right up to local, national and international competitions. At whatever level you play, you are guaranteed to meet a new network of friends! One of the comments we often hear from student is how bridge has added a new dimension to their lives. As well as the intellectual and competitive elements, the social side of bridge cannot be underestimated. Many lifelong friendships are formed at the bridge table!